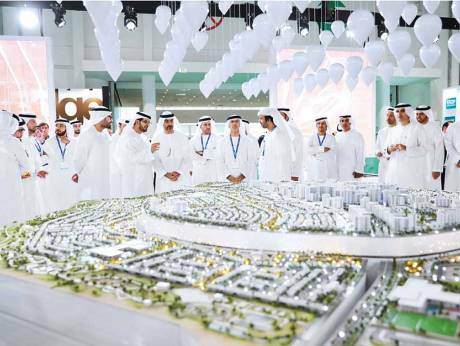 Cityscape Abu Dhabi kicked off on Tuesday with property developers showcasing a number of projects that are in different stages of completion. The three-day event was inaugurated by Shaikh Hamed Bin Zayed Al Nahyan, chief of Abu Dhabi Crown Prince’s court and a member of the executive council of Abu Dhabi. Aldar Properties is showcasing its Dh10 billion Al Ghadeer mixed-use master plan close to the Abu Dhabi-Dubai border. Sales for the first neighbourhood of 611 homes began at Cityscape Abu Dhabi with a number of people lining up outside the Aldar stand to inquire about the latest offering from the Abu Dhabi based property developer. The project will have more than 14,000 homes with the first phase expected to be completed in 2021. Maisonette prices start from Dh290,000 and town houses from Dh899,900. Speaking to reporters on the sidelines of the event, Talal Al Dhiyebi, CEO of Aldar Properties, expressed optimism about demand for affordable housing. In 2017, Aldar achieved Dh3.5 billion worth of new off-plan sales despite the current market conditions, he said. The company is also looking at acquisitions in Abu Dhabi and outside due to a number of opportunities available in the current markets opportunities, Al Dhiyebi added. Bloom Properties, on the other hand said they are looking at international expansion with a project in Minnesota in the US for senior living housing. Other developers like Imkan, Tamouh Investments are also showcasing their projects at the event.